(the American Foundation for AIDS Research – a non-profit). Or make a donation to AEGIS – the AIDS Education Global Information System. Sister Mary Elizabeth has been doing this good work for many years and can always use a bit of help! The reason? My partner Emma had reached the end of her 5 years of classes, study and candidacy (internship) and it was time for her interview to determine if she would become a pastor in the Universal Fellowship of Metropolitan Community Church (UFMCC – or MCC for short). 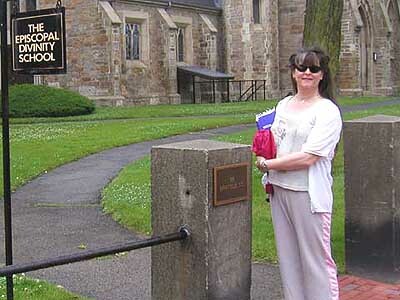 Her interview was scheduled for Sat June 19th in Boston, so we made plans to drive up on Thursday, spend Friday relaxing and seeing the sights, then drive back to Virginia Saturday after her interview. 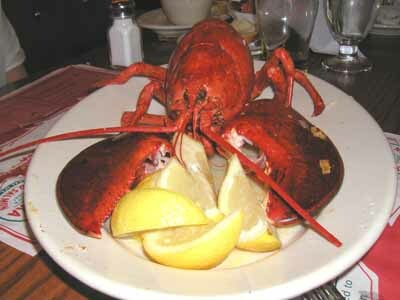 And the lobster?? 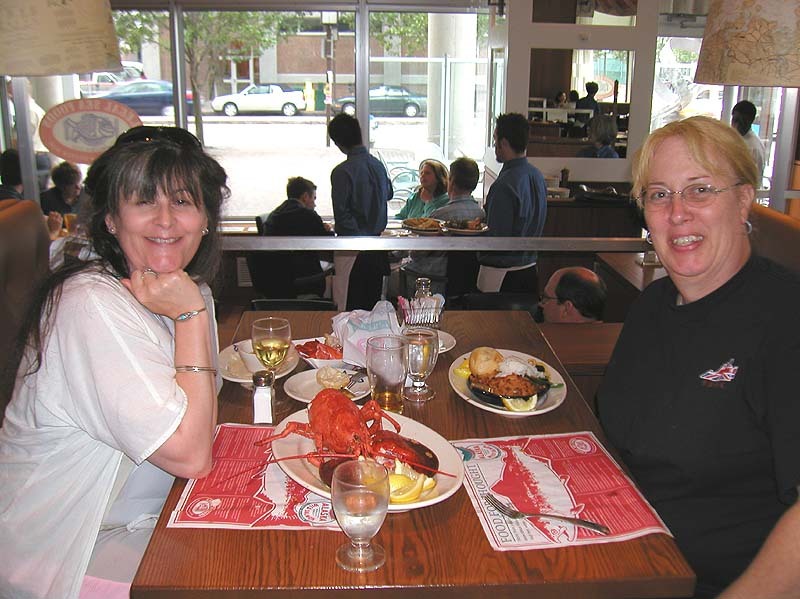 I promised her a New England Lobster dinner while we were in Boston, so we dropped by Legal Seafood at Kendall Square in Cambridge and had a fine dinner – lots of fun! 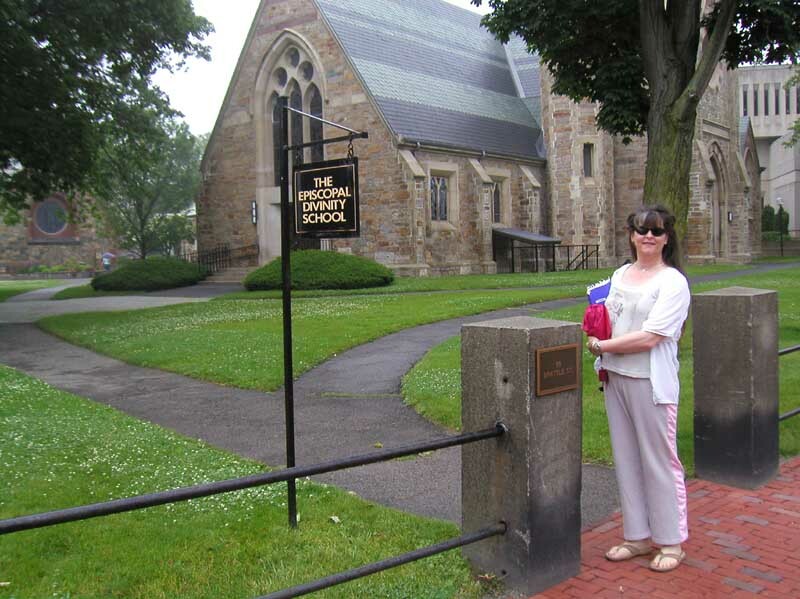 Saturday morning I took her to the MCC interview at the Episcopal Divinity School – and a bit over 1 hour later, she was Reverend-Elect! More parent packing – and Stock the Pond! Emma and I went to Dad’s house Saturday to help him finish sorting through all the piles of stuff left from 40 years of living in the same house. I have a scarey collection of old photos now (grin) my original birth certificate (with footprints! ), and tons of old books and things . Well – my coworkers, the “Gal-Gang” aka, the usual suspects, tarted up my cube last night, in memory of me hitting the big 50. 50? Who’d a thunk it? That was a long time ago for me – before my changes – and a long time ago for him – before he got divorced. That side of my family was baptist/fundamentalist – so I never was particularly close to any of them, but its still a big shock to my aunt and the rest of the family, so, out of respect to the family, Emma and I’ll will be going to the visitation on Sunday. Dad’s sister’s son (he was the eldest of her two kids) died around 20 years ago – on reflection, I’d say he may have been part of the first wave who died of GRID … no one says anything like that – but looking back on it, he had the signs of being “family”. Dad’s brother had 4 sons, and Ronnie was his eldest … Of course, I’m the eldest of Dad’s kids – and I’ve had my struggles over the years … but since I met Emma and finally sobered up, life has been great. Big Fish – pond frozen but thawing! I got home from work early and sat in the living room chair, catching up on the paper (the Washington Post). 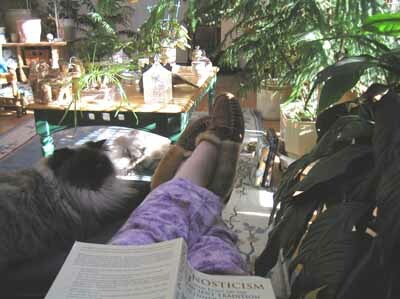 I’ve been redoing the living room over the last month – throwing out the old Doxsey shelves from the Door Store, putting in new floor to ceiling shelves, so it was nice to sit in the open space, put my foot up on a cushion and open the paper. And when my cat Dolly jumped onto my legs a few moments later, it seemed the perfect time to put down the paper, close my eyes, and rest a bit before Emma got home. Emma got home 20 minutes later, and as we fixed dinner, she told me she’d felt the rumble a mile away at church. We figured it was an earthquake, and a few minutes later when I turned on the evening TV news, they confirmed it – a magnitude 4.5 quake near Richmond VA.